Be sure to read the rest of the GenTech Rebellion books. Winning Glory, Honor Bound, Claiming, Charity, and Loving Hope. Listen to Greg Salinas narrate a snippet right here! Faith fled her compound one wintry night with four other genetically modified women. Glory, Honor, Charity, and Hope have all found men who adore them. Faith is happy for her sisters, but it’s lonely on her own. A man piqued her interest, but she ran the probabilities, and the odds of him ever being interested in her are thin. Tough and forbidding, Reginald was a field surgeon in the Middle East. He eats and breathes medicine. Besides, he’s married to the CIA. No wives in his past. Faith hacked into the personnel database to check. Reginald Thomas agreed to run the CIA’s infirmary after a bullet nailed him in Afghanistan. He’s one of a handful of scientists who produced the original batches of genetically modified humans, and he’s laid low since their rebellion. The catastrophe rankles, but he hasn’t given up finding a fix for their genome problems. A permanent bachelor for a host of feeble reasons, he’s substituted immersion in medicine and science for a personal life. Easier that way. And a whole lot cleaner. The status quo might be sterile, but at least it’s trouble free. 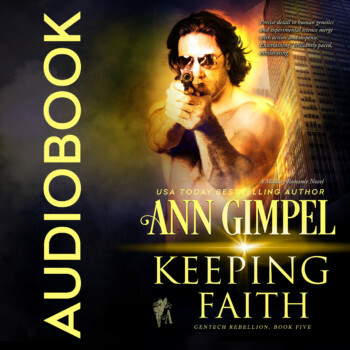 When Faith catches his eye, he fights his attraction to her, but it’s a losing battle. Loving her fulfills him, and he can’t walk away. What will happen if she discovers he helped create those like her? In a radical departure from his normal forthright manner, he buries that fact deep. If she never finds out, it can’t ever come back to bite him.